In this exclusive sneak peek, get your first look at DC's 'Final Crisis' spinoff event by superstars Geoff Johns and George Perez! The Legion of Super-Heroes stand poised to go prime time in more ways than one. Superstar creators Geoff Johns (Green Lantern, Justice Society of America) and George Perez (The Brave and the Bold) team up to present The Legion of Three Worlds, a five-issue, August-launching event mini-series spinning out Final Crisis. And as the title implies, readers get three Legion teams the original squad from Johns' recent run in Action Comics, the "Zero Hour" era version that went into limbo and the Mark Waid-Barry Kitson rebellious teen edition, currently in the hands of writer Jim Shooter for the price of one as presented by two of the biggest, hottest creators working in comics. "You can equate it to what we did with [Green Lantern: Rebirth], but on a bigger scale," explains Johns. "It's involving Superman, the DCU as a whole and the 31st century. It's the Crisis of the 31st century. There's a story to tell, but the purpose is to reintroduce the concept of the Legion, spend some time there, see what they're all about, and clear up questions people have about them." The story takes place in the aftermath of Johns' Legion story from Action Comics, as Earth of the 31st century finds itself caught in the grip of xenophobia. The United Planets, a conglomeration of worlds throughout the galaxy, have condemned Earth for its practices the government was exiling and interring aliens in concentration camps'and support for the Legion is at an all-time low.Into this atmosphere of paranoia and mistrust enters long-time Legion villain the Time Trapper, whose diabolical mechanizations in the form of an unexpected surprise villain you'll see on the last page of this exclusive preview are designed to destroy the Legion once and for all. 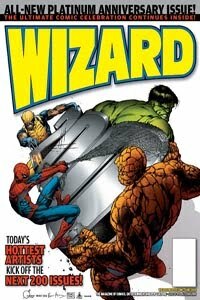 To order Wizard #200 PLATINUM from a comic shop near you click here. • All-star jam cover by Bryan Hitch, Steve McNiven, Joe Quesada and Michael Turner! • The 200 greatest characters in comic book history! Who's #1? • TONS OF ANNIVERSARY GOODNESS RETCONNED ENTIRELY BY MEPHISTO!